15" FRX Hats are a pro-level B20 Bronze pairing that delivers exceptional versatility, clean sticking and crisp response. SABIAN FRX (Frequency Reduced) cymbals are designed for playing environments where other cymbals have too much attack. They are NOT low volume cymbals. Rather, they work by cutting specific frequencies that result in the perception of volume. Remove those frequencies, and suddenly 15" FRX Hats sit perfectly in the mix, no matter how hard you play. No compromise - no holding back. The SABIAN 19" FRX Crash is a pro-level, extra-thin B20 Bronze crash that delivers quick, shimmering response and exceptionally soft feel. 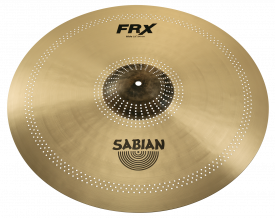 SABIAN FRX (Frequency Reduced) cymbals are designed for playing environments where other cymbals have too much attack. They are NOT low volume cymbals. Rather, they work by cutting specific frequencies that result in the perception of volume. Remove those frequencies, and suddenly your 19" FRX Crash sits perfectly in the mix, no matter how hard you play. No compromise - no holding back. The SABIAN 22" FRX Ride is a pro-level, B20 Bronze light ride that provides dark, crisp sticking with buttery-soft feel. 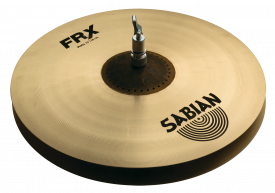 SABIAN FRX (Frequency Reduced) cymbals are designed for playing environments where other cymbals have too much attack. They are NOT low volume cymbals. Rather, they work by cutting specific frequencies that result in the perception of volume. Remove those frequencies, and suddenly your 22" FRX Ride sits perfectly in the mix, no matter how hard you play. No compromise - no holding back.